I love zucchini, and I love finding new ways to use it in recipes. I am a big fan of Zucchini Brownies, but I wanted to try out more of a bread this time. Since I have trouble getting breads to cook all the way through and it doesn’t seem to get eaten as well in our house, I like to make muffins instead. So, I looked up a bread recipe and decided to add chocolate chips to still get the chocolate flavor. And, well, the results are great! I don’t think these muffins will last long in my house, my kids are all over them. You can see a little green in these, although it’s hard to really tell in the picture above, but they don’t seem to care. To them, it’s a muffin, and it’s good! Beat the eggs, oil, vanilla, and sugar together in a large bowl. Add the dry ingredients to the creamed mixture, and beat well. 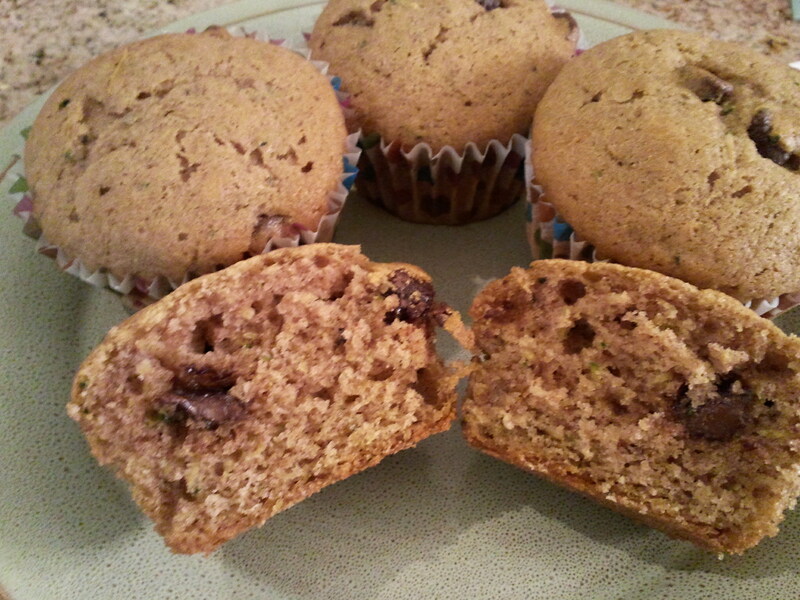 Stir in zucchini and chocolate chips until well combined. Line with paper liners or spray a 12 cup muffin pan. Bake in the preheated oven for 20 to 25 minutes, or until a toothpick inserted in the center of a muffin comes out clean. Allow to cool for a few minutes, then remove to a cooling rack. Repeat for the rest of the batter. Yields 24 muffins. 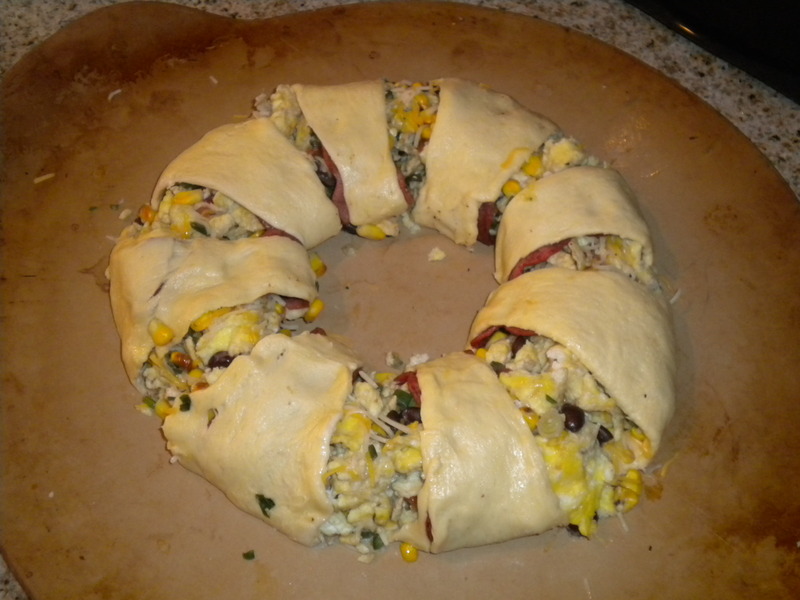 I was first introduced to wreaths at a Pampered Chef Party, a Turkey Cranberry Wreath (I will share the recipe soon!). I’ve also made a Taco Wreath. 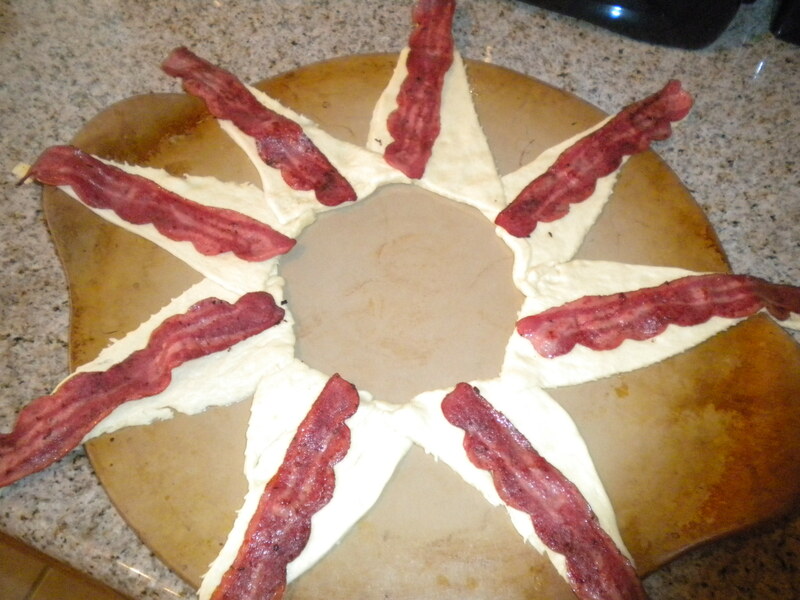 So, when I saw a Breakfast Wreath on Pinterest, I knew I wanted to give it a try! It’s really easy, and I added in some of the Roasted Corn Salsa I had in the fridge. It was delicious, and I will be making this again! There are many possibilities with this one, I used eggs, bacon, cheese, and the salsa, but you could do any combination of eggs, bacon, sausage, hash browns, vegetables, and cheese, based on your breakfast favorites. Also, there are 2 ways to make wreaths, this one I used 1 can of 8 crescent rolls, and when I share the Turkey Cranberry Wreath, it uses 2 cans of 8 crescent rolls. 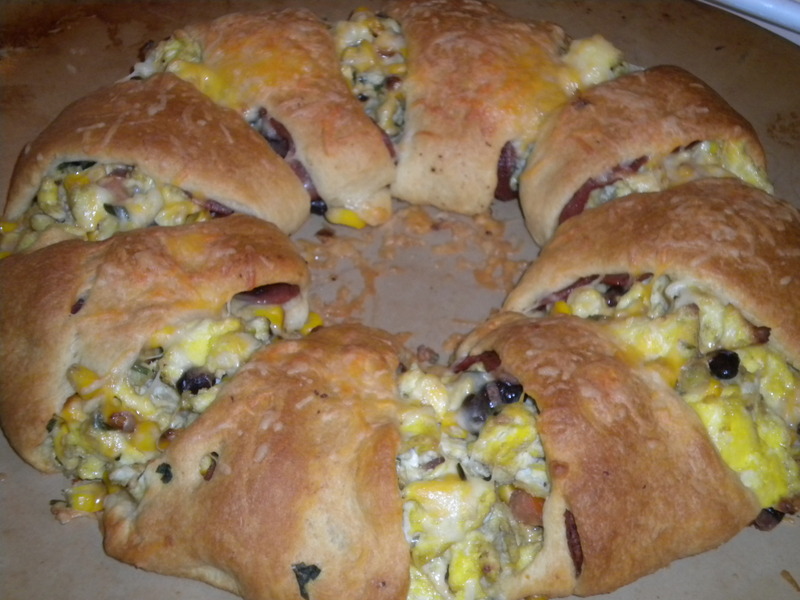 You could make this Breakfast Wreath using the 2 can method instead, the 2 can method covers the filling more, but with 1 can, you still get good coverage too. 1 cup shredded cheese, I used Mexican blend, but you could use cheddar, colby jack, pepper jack, etc. Scramble the eggs and add in any other veggies you want to use. Unroll crescent dough; separate into 8 triangles. With wide ends of triangles toward the center, arrange the 8 triangles in a circle on large round baking stone or on a greased baking sheet. The corners of wide ends should overlap and points will extend 1 inch beyond baking stone. Lay a piece of cooked bacon on each triangle. 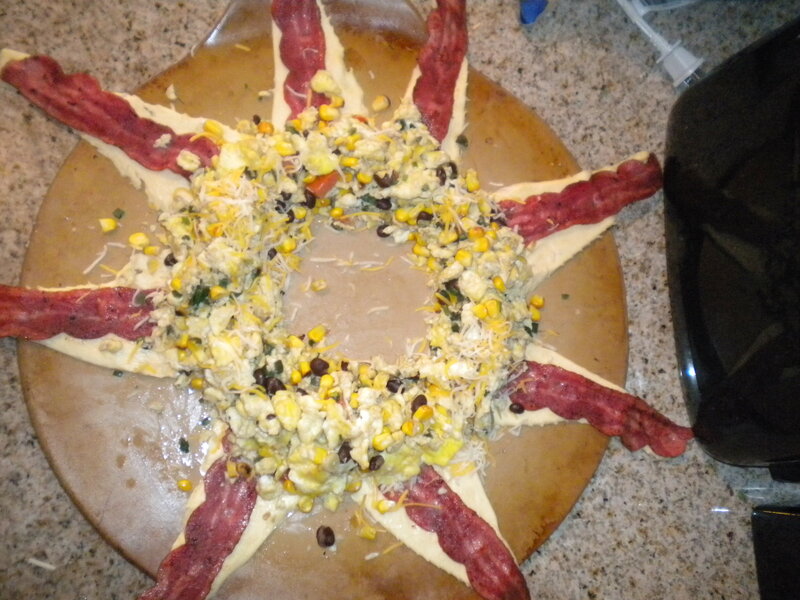 Spread 1/3 cup of the shredded cheese around the inner circle of the wreath. Scoop egg filling onto the dough on top of the cheese. Top the filling with another 1/3 cup of cheese. Lift the ends of the crescent rolls over the filling and tuck under the middle of the ring. Brush the dough with a beaten egg or olive oil. Sprinkle the remaining 1/3 cup cheese over the dough. 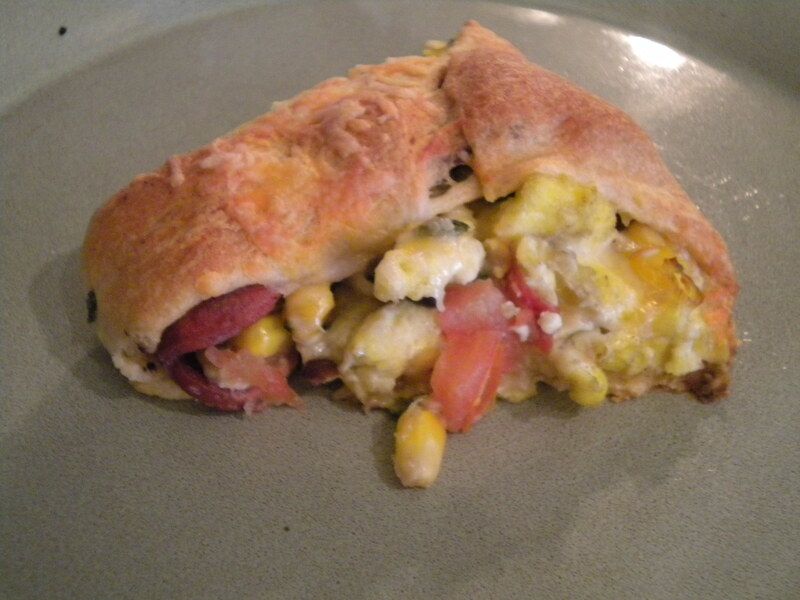 Bake in the preheated oven for 15 – 17 minutes, or until crescent rolls are golden brown. Cut into 8 pieces and serve. I made these tonight to go with the Garlic Butter Shrimp we had tonight. 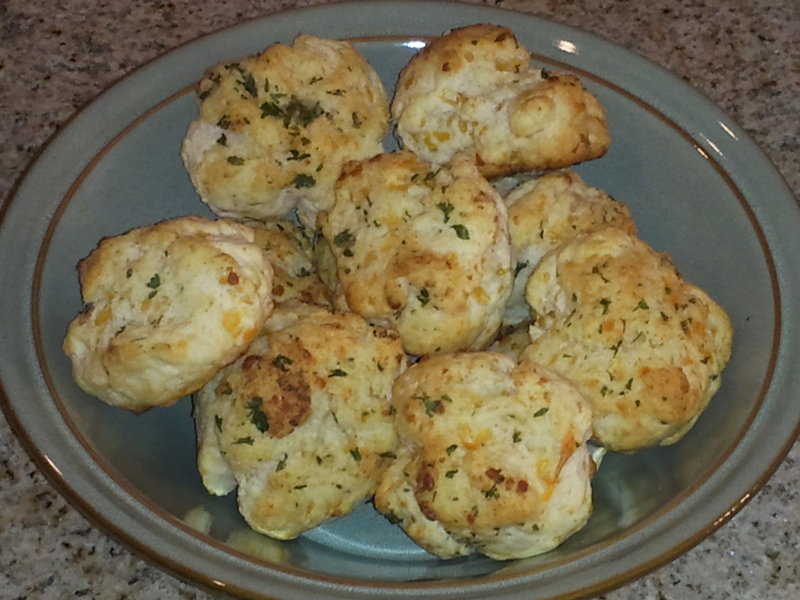 These taste a lot like the biscuits they serve at Red Lobster, and aren’t very hard to make. Mix together the Bisquick, milk, cheese, and 1/4 tsp garlic powder in a bowl. 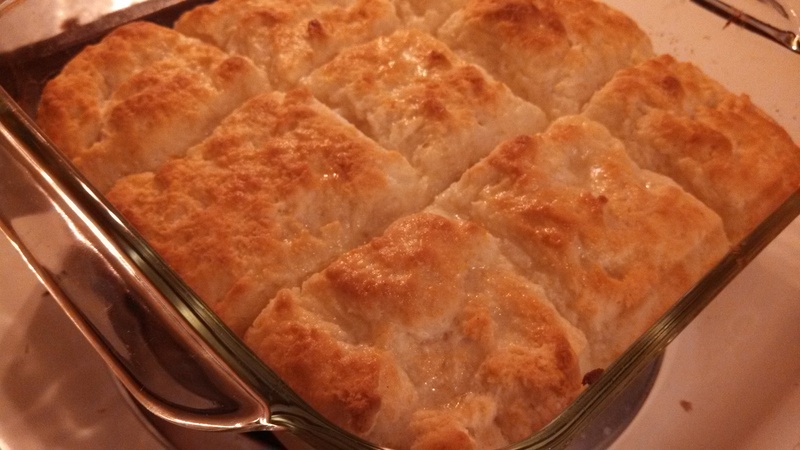 Drop biscuits by spoonful onto an ungreased baking sheet, you should have dough to make 12 biscuits. 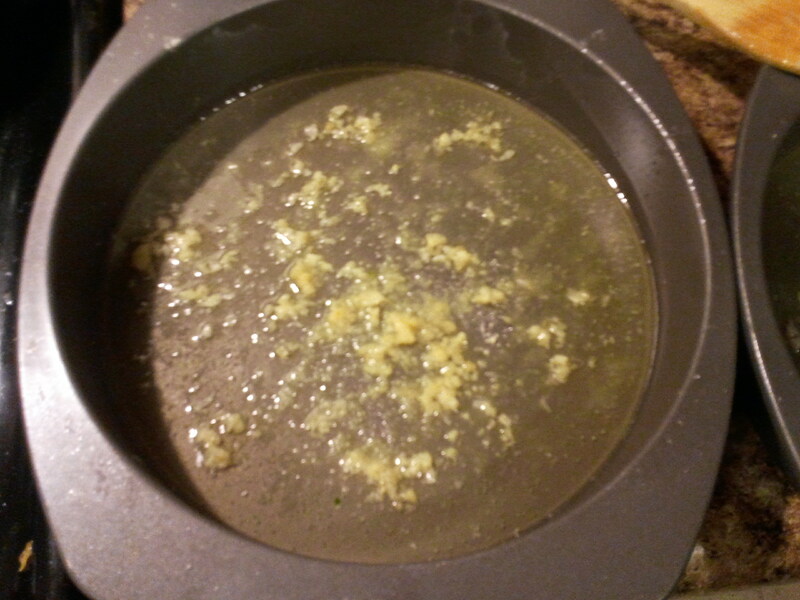 Melt butter, and stir in the remaining 1/2 teaspoon garlic powder and the parsley. Brush half of the mixture over all the biscuits. Bake in the preheated oven for 8-10 minutes. Remove from oven and brush the remaining butter mixture over all the biscuits. 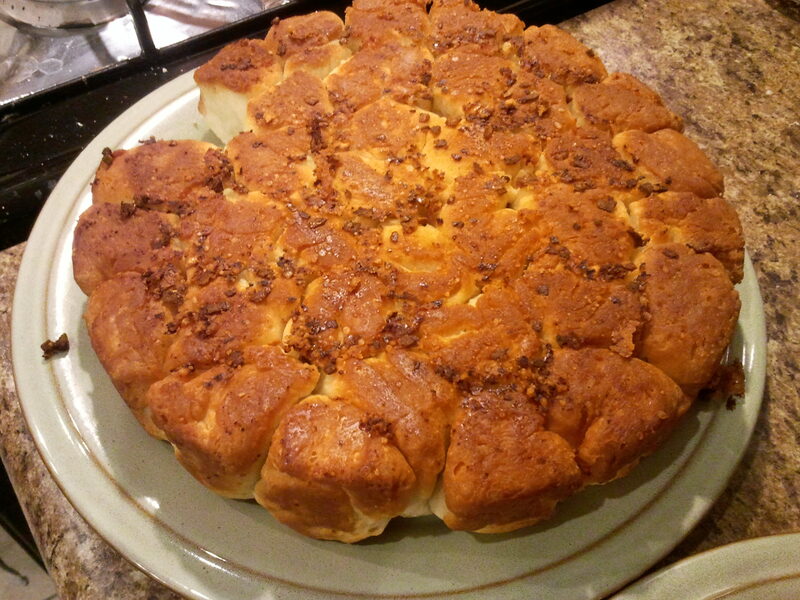 You may remember a while back that I posted the recipe for Parmesan Garlic Pull Apart Bread, using Grands biscuits. Well, tonight I wanted the bread, but didn’t have any Grands biscuits. I found a great substitute – Bisquick biscuits. You just make the dough according to the directions on the box, 2 1/4 cups Biquick mixed wtih 2/3 cup milk, then roll the dough into balls to drop in the pan for the pull apart bread. Yum! My friend Mhairi posted a recipe on Facebook she had gotten from MOMables, and I decided I needed to give it a try. 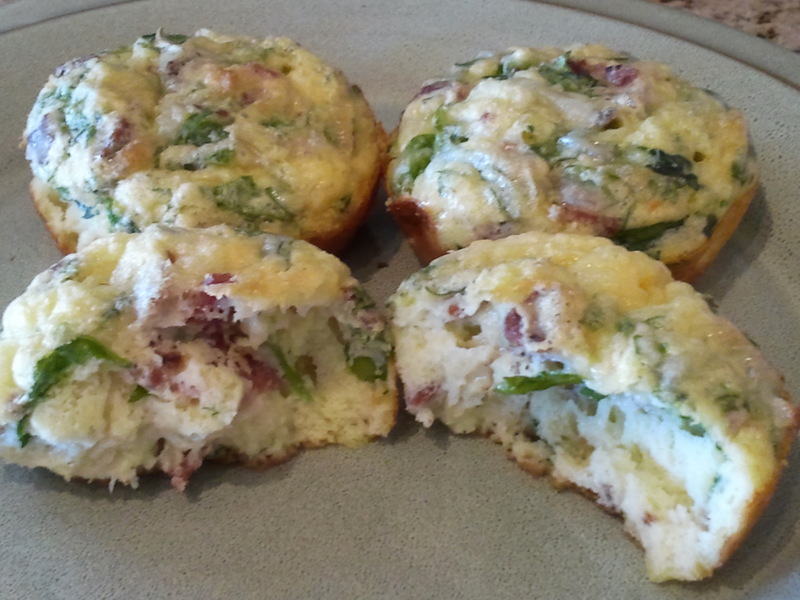 They called them Breakfast Cupcakes, but I think Omelette Muffins is a better description. It is pretty egg-y, like an omelette, but the Bisquick makes it more like a biscuit or muffin. You can make up a bunch of these ahead of time, then freeze and reheat when you need them. Plus, there are a lot of possibilities on what to have in these. I chose mozzarella, turkey bacon, and spinach, because that’s what I had on hand, but swiss cheese would have been perfect with these too. Or, cheddar cheese, ham, and broccoli would be a good combination too. Or pepper jack, sausage, and green pepper and onions. Green onion would be a tasty addition. In mine, I added in garlic powder, although next time I think I would use garlic salt, and rosemary. I think black pepper would be a great addition too. For the ingredients listed below, I got 18 muffins. 1/2 cup meat of your choice, diced ham, crumbled bacon, turkey, crumbled sausage, etc. 1/2 cup diced veggies of choice, broccoli, spinach, etc. Pre-heat your oven to 350 F. Grease a regular sized muffin pan (or use liners). In a mixing bowl, beat eggs, milk, and Bisquick mix. Then add cheese and toppings and mix well. Pour into the muffin pan, filling up about 3/4 of the way. Bake for 10-15 minutes, or until golden brown. Cool for 5 minutes, then transfer to a cooling rack. I am FINALLY getting around to using the pumpkin I prepared a few weeks ago. It’s been sitting in my freezer patiently. I took some out of the freezer earlier this week, so today was the day to use it. 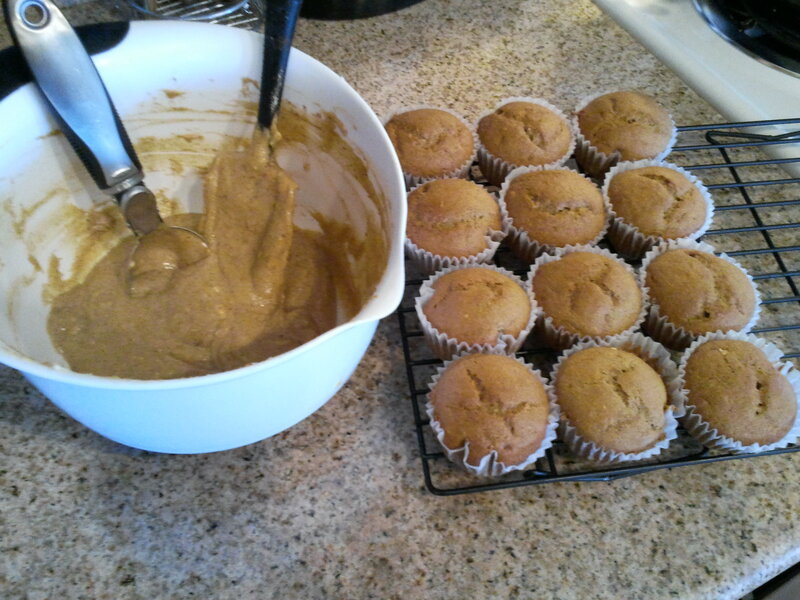 And, I decided to make Pumpkin Gingerbread muffins with it. This is a recipe that I got from my friend, Cyndy at Daily Cynema. She has a lot of other great recipes too, in fact, I’m hoping to try out her pumpkin pancake recipe in the near future. Here is the link to her recipe: Pumpkin Gingerbread Muffins. I follow it exactly, except that instead of 1 can of pumpkin, I used 1 3/4 cups of fresh pumpkin. Such a great holiday treat! 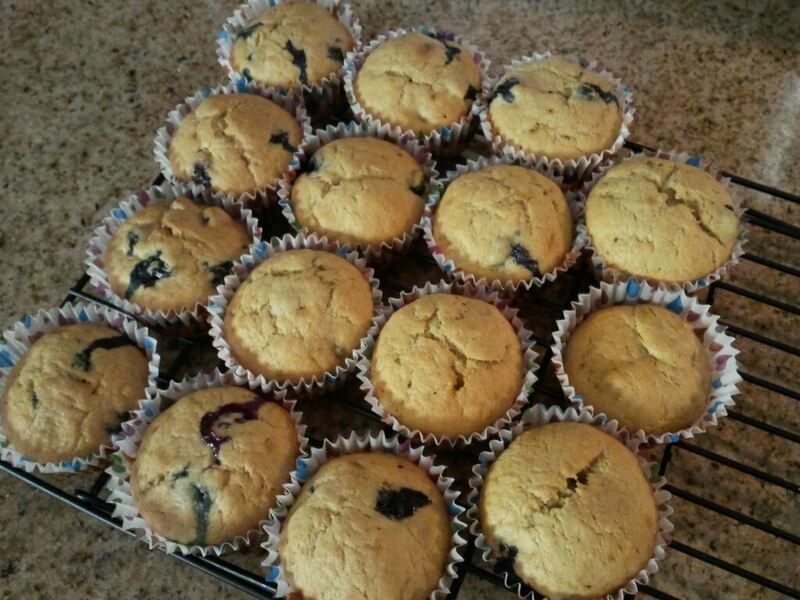 Almost forgot, this made 2 dozen yummy muffins. Over the last 2 weeks of Bountiful Baskets, I have gotten a lot of garlic. I don’t usually use fresh garlic, but since I have it, I needed to find ways to use it. This recipe is a lot like monkey bread, a favorite of mine that my sister always makes for Christmas morning breakfast. I had read a post about the Parmesan Pull Apart Bread at My Kinda Rain, and changed up the recipe a bit based on what I had and what pans I had. Tonight I decided it was time to make it again with the fresh garlic I had, and oh man, I had forgotten how good this bread is! It was the perfect complement to the Spaghetti Pie we had (which I will be writing about very soon!). Preheat your oven to 375 F. Melt butter in a small pan on the stove, and stir in the minced garlic. Pour the mixture into a 9 in round baking pan. Sprinkle in the Parmesan cheese and garlic salt. Cut each Grands biscuit into 4 pieces and gently roll each piece in your hands. Drop into the pan. It doesn’t have to be too tightly together, there can be small gaps because the dough will expand some while baking. Bake for 12-15 minutes, or until tops of dough just start to brown. Remove from oven and immediately flip bread onto a plate to serve. * You can also make biscuit dough according to the package directions on a box of Bisquick. With regular Bisquick, it is 2 1/4 cups Bisquick and 2/3 cup milk, then just mix together. 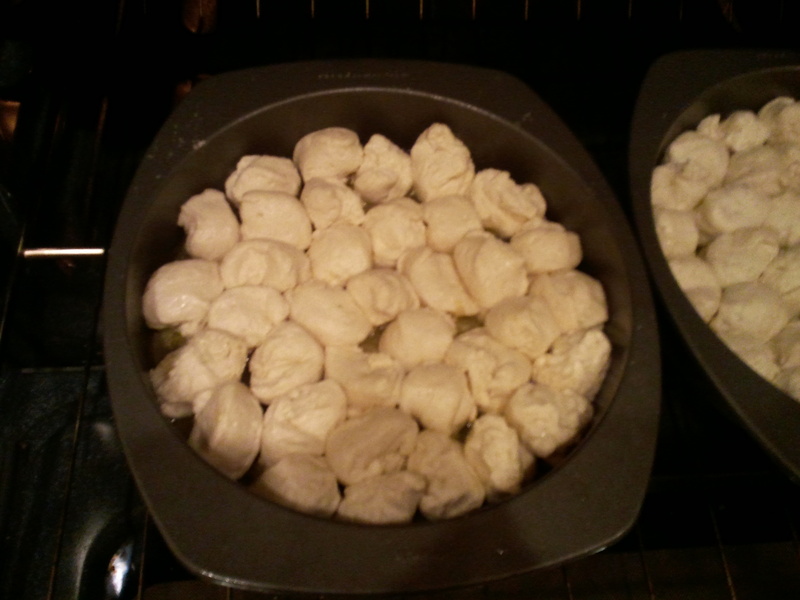 Roll the dough into balls, and follow the remaining directions above. When I picked up my Bountiful Basket from my friend’s house last weekend, she gave me her fennel. I’ve seen it before, and I think even had gotten in a basket before, but didn’t get a chance to figure out what to do with it until it had gone bad. 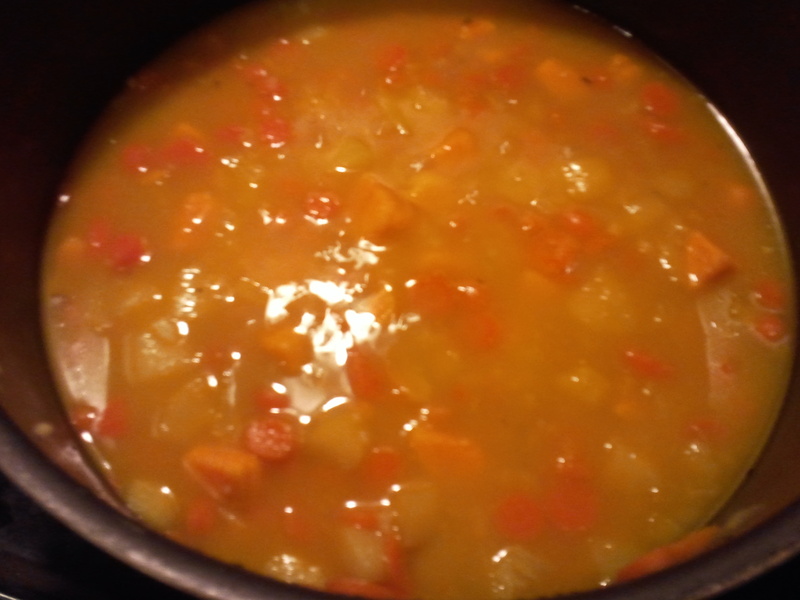 I went in search of a recipe and found this Fennel Carrot Soup, plus I had carrots, sweet potatoes, and apples already on hand to make this. The recipe only calls for fennel seeds, but I added in the fennel bulb I had as well as the seeds. If you have never used a fennel bulb, there is an informative video here on different ways to cut the bulb. I chose to dice mine. 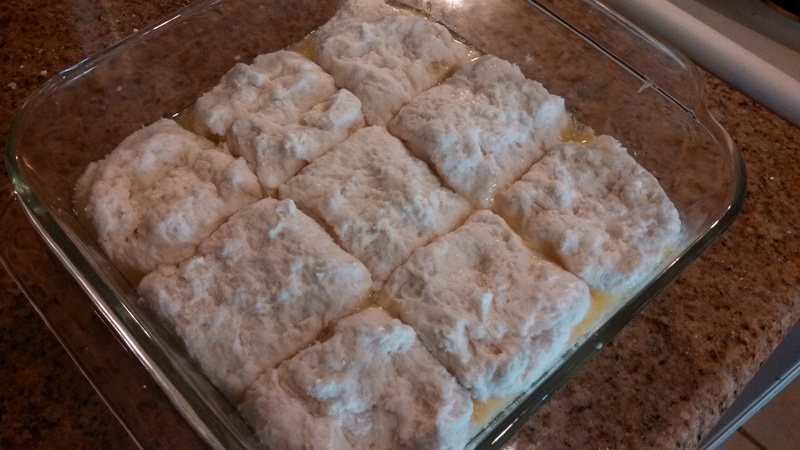 Then, I had found an interesting biscuit recipe on Pinterest called 7-Up biscuits. I had attempted to make them a couple of nights ago, but didn’t pay attention to the amount of 7-Up to add and put in too much. Tonight went much better. Overall, the soup was ok and the biscuits were excellent. I’m not sure what it was about the soup, it was good, but not fantastic. I think it was too much carrot or maybe too bland. I chose not to use curry as called for in the original recipe, putting in garlic instead. Or maybe I was tasting more fennel and didn’t like it. I also think I might have added too much lemon juice. I don’t know. The biscuits were very good, very light and fluffy. Mine didn’t turn out as pretty as the Pinterest picture, but the taste was great. 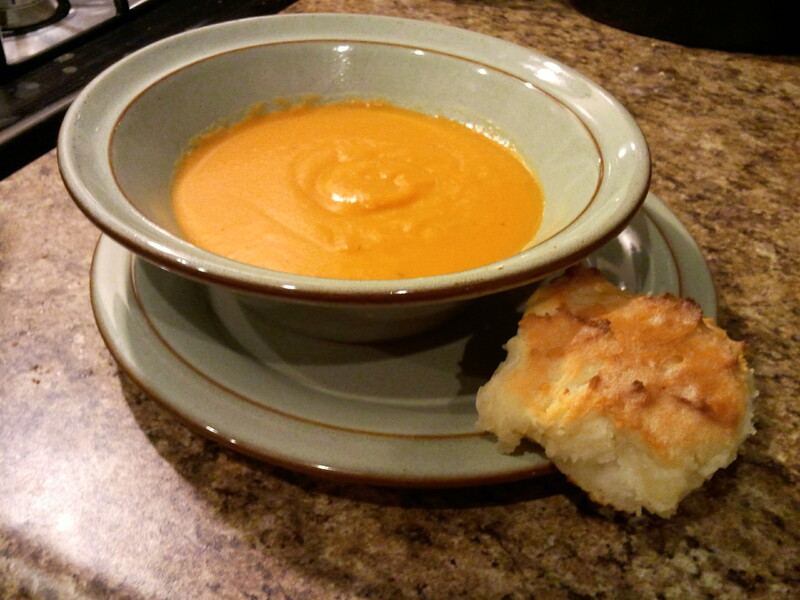 So, here is how I made the soup and the biscuits. In a large saucepan, saute fennel seed and garlic in butter for 2-3 minutes or until lightly toasted. Add the fennel bulb, carrots, sweet potato and apple; saute for 5 minutes. Stir in the water, bouillon cubes, rice, and bay leaf; bring to a boil. Reduce heat; cover and simmer for 30 minutes or until rice and vegetables are very tender. Remove from the heat and cool slightly. Discard bay leaf. 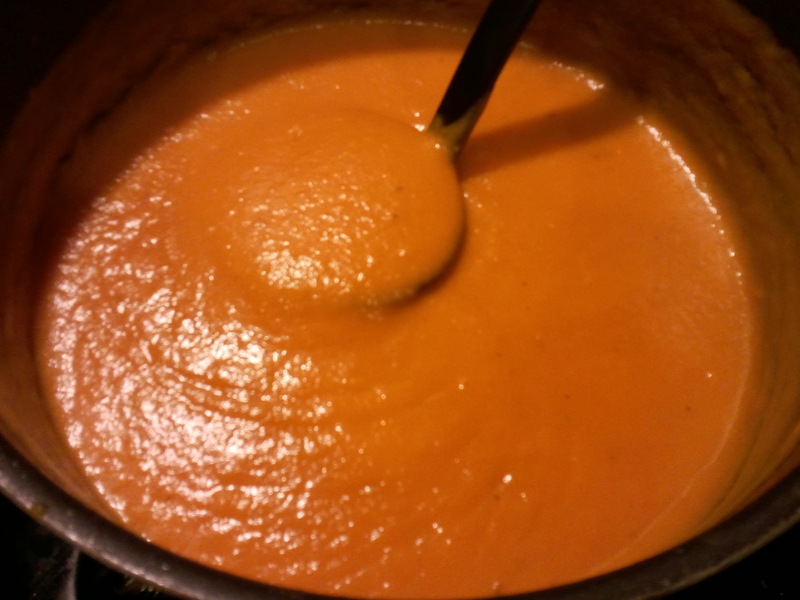 In a blender or food processor, process soup in batches until pureed. Return to saucepan. Stir in the lemon juice, salt and pepper. Cook for 5 minutes or until heated through. Cut sour cream into biscuit mix. If you have never cut dough, there is a handy tool called a pastry cutter or dough blender. I do not have one of these, so I did the best I could with a fork. Add 7-Up and mix in well. You may find the dough to be sticky, if so, add more Bisquick or flour (about 1 tablespoon) until you can better work with it. Don’t worry, even if the dough is sticky, they still bake fine. Sprinkle flour on board or table and pat dough out to the shape of an 8×8 pan. Cut dough into 9 squares. Pour all but 1 Tbsp of the melted butter in an 8×8 pan. Place cut biscuits in pan. Bake for 12-15 minutes or until golden brown. Brush the remaining 1 Tbsp of butter over hot biscuits.